all4design-design4all: EXPO MILANO 2015: Feeding the planet, energy for life and...storm trooper street style? EXPO MILANO 2015: Feeding the planet, energy for life and...storm trooper street style? The Theme: "Expo Milano 2015 offers an opportunity to reflect upon, and discuss, solutions to the contradictions of our world today. Debating the theme is also a time of sharing and celebration, with speaker meetings, events, and shows". That is certainly a more-than-noble cause for Expo Milano 2015, which has officially opened its doors on the 1st of May 2015 to the twenty million visitors that are expected to come over the next six months. 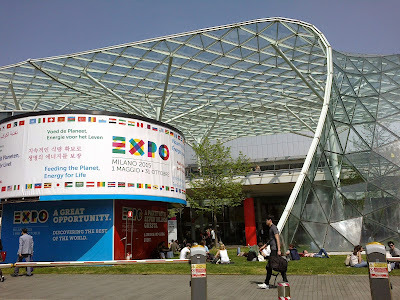 Among the many highlights, (exceptional events, unconceivable corporate pavilions, non-governmental and international organizations, seminars, parties and happenings of all kinds, destined to every audience, from 1 to 99 years old), please note down the ambitious, yet full of innovative guidelines and new patents for our design eco-future, Siexpo 2015: Sustainability and Innovation 2015. (check: http://www.siexpo2015.it/index.phtml?Id_VMenu=304). Society, energy, biodiversity, tolerance and philanthropy seem to stir a great deal, as the fundamental key features in the pavilions this year. Hypocricy or successful marketing? Whatever the answer might be, in general there is a strong tendency to re-explore, re-address and re-design important living notions, not only because it is highly marketable but because it seems to exceed a common-type need, an alternative to survival, for future generations use. The honest aspirations of the organizers, towards the very many issues and novelties of global production, did not manage to prevent calamities and collateral conflict. Black bloc riots, made by anarchists, anti-globalization activists and anti-austerity campaigners- an expected reaction to a very doubtful world of tremendous injustice and legitimized crime. The protestants executed heavy damages in Milan city streets, when at the same time, government, EU officials and the police were desperately seeking players to incarnate "The Evil Crowd", Hollywood style, like Darth Vader's Imperial Storm Troopers in Star Wars movies. (: Possibilities: Essays on Hierarchy, Rebellion, and Desire by David Graeber, AK Press, 2007). Expo Milano 2015 closes curtains on the 31st of October 2015. Until then profit of a small escapade to beautiful Milan and explore possibilities, throughout all the aspects of the event and towards personal enlightenment. Enjoy to the fullest!!! International Museum Day Hot List 2015!